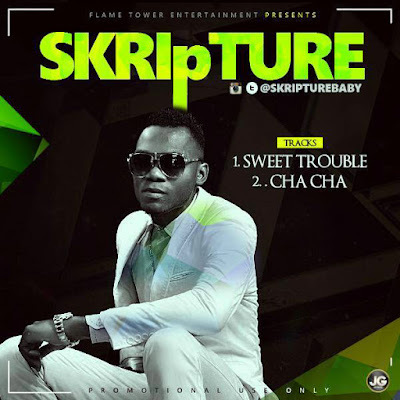 Following the successful release of Skripture’s second single titled “ife to dun” which is still gathering impressive radio air-play as well as TV rotation, the Flame Tower entertainment signee shows his diversity. Following it up with two massive single.“Sweet Trouble” and Cha-Cha is a mid tempo hi life/pop R&B song laced with live guitar played by and produced by so plain. With a well composed lyrics and delivery from him and a sing along feel and lyrics. Sweet trouble and cha-cha is a song that will appeal to every audience, clubs, radio, mostly the ladies who are about to walk to the altar, realistically no one saw this coming from this lad, Skripture has shown his diversity and good composed lyrics in all his songs, there is no doubt in my mindSkripture will stand tall when the names of great singers is mention in the world!